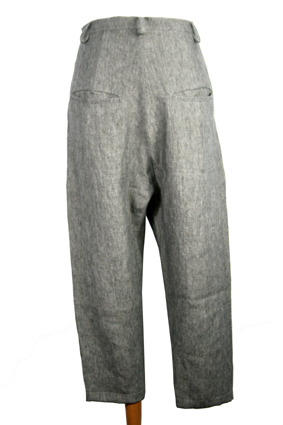 Barbara Bologna low crotch, shaped trousers in linen herringbone fabric. Zip fly with leather button fastening attached with black woven fabric tape.2 side pockets and 2 rear pockets. belt loops. Tapering legs. These are beautiful trousers that match the jacket in the same fabric to create a suit.